Join us for Philanthropy Day 2018! 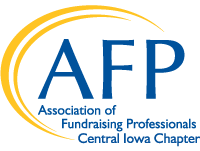 The Central Iowa Chapter of the Association of Fundraising Professionals is excited to celebrate the 33rd Annual Philanthropy Day Awards Luncheon. We will be recognizing leaders, organizations and youth promoting philanthropy at this year’s event, held Friday, November 16, 2018. Please join us in celebrating and honoring those that make such a difference in Central Iowa through their commitment to philanthropy. Registration information will be released in the fall of 2018.